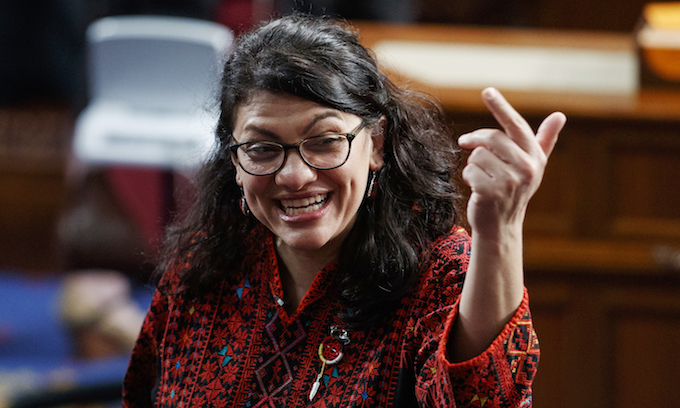 GOPUSA Editor: Some are asking who elected Tlaib. Demographics – Michigan’s 13th congressional district – since January 3, 2013.
Who are the people that are getting these idiots elected? Have they lost all sense of real thought? What do they expect these people are GOING to do? Work in favor of the American Way? Be objective? Uphold American values and ideals? I am constantly blown away with the total ignorance of the people that vote for these enemies of the state. Cui bono? Literally “to whom is it a benefit?”—The destruction of the U.S.—Schwartz György, known as George Soros. She was elected from Detroit, the heaviest Muslim area of the country. Sand… Those electing her are fellow ANTI-AMERICAN Mudslime immigrants… WHO imo shouldn’t even be voting. My point exactly in my previous comments. We keep bitchin’ about the people we elect but we keep on sending them to Washington(libs and conservatives alike). Would someone please read the report submitted by Mr. Gingrich on the real threat to America. You Tube has an audio book titled “One second after” that should open our eyes. Listen and wake up. God willing REAL Americans will put the personal partisan political agendas aside so America can survive. L.M. These are full blown idiots, they’ll tear down this great country and leave it in shambles…. “Many civil and human rights advocates are calling this cruel and unusual punishment.” These are NOT people advocating human rights, but preserving human wrongs where unearning Illegal aliens get the same EARNED rights as natural or naturalized citizens by just showing up,,,, where law breaking, which is the first act that they commit upon illegally entering America is placed on par with legal obedience to our American laws. It is not cruel or unusual to punish law breakers and when that day comes to America when it is considered cruel the inmates have taken over the asylum and, the freedom law abiding Americans of personal integrity can just lay down as the socialist train runs over them, and WE THE PEOPLE become we their slaves, starting with their media and educational beguilement and indoctrination in mind slavery to their wills, followed by forced taxpaying economic slavery in debt, ending in actual physical chains and internment camps. The formula is old, tried, and tested, and prevails only when good men do and say nothing. As we stop being good we soon stop being great, something that Trump has now re-awakened to the deepest socialist fears, disguised in Democrat tears. Don’t fall for one more Liberal Fairy Khan job. And last i looked, there was NO human right to illegally enter any country you damn well want to, and have YOUR rights override the RULES and laws of that country you illegally enter. These are anything BUT idiots; they are calculated and know exactly what they are doing. That is the most scary fact of all and it is just now happening here but has been ongoing for years in Europe. It is ambivalence that allows this and for that we as a population must awake from this slumber while this takes root and happen here with our blessing by our inaction. This is precisely what happens when you let the fox into the hen house………….very sad indeed. The wholesale importation of followers of Islam by the chief Muslim himself BHO has resulted in portions of our country becoming hotbeds of ISIS. When you get a majority that belief in sharia law is the only way and screw the COTUS. It’s like having a member of the KKK in Congress. Minn. is America’s version of the UK. That is how it happened here….. Prediction: Terrorist attacks will start as we get closer to the 2020 election. Muslims will carry out the attacks, aided and abetted by liberals, RINOs, the liberal news media and radicals in Congress. This will be the next step as libs follow Alinsky’s Rules for Radicals. Be ready patriots! Oh you mean like so many DEMS were?? Let’s be clear… There is NO other country in the world that allows NON CITIZENS to collect Social Benefits without paying a FEE! My son is in England (as a student) and NOT allowed to access ANY Social Services unless he pays their annual fee to access health care. Why is it that in the USA, we allow non citizens to access, not just health care, but every other social service we have? It is causing us to go completely broke! This has to change, NOW!!!! Because we hav too many morons in office.. It is the advocates job to bend language to their purpose. It is cruel and unusual to allow foreigners to think they can just walk in and claim rights and benefits. This woman is a little smarter than Omar, but not much. 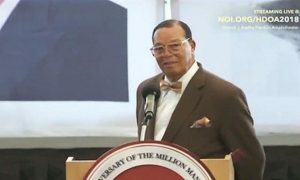 She is a Farrakhan supporter no matter what she says. She basically is a disgrace to the Congress. Maybe she will be smart enough to keep her mouth shut. Some of these people think that just because they got elected and don’t like Pres Trump they can do anything they want. Guess Omar found out differently, and if you think Tlaib feels any different that Omar, I have a bridge you might be interested in buying. America is on a path to destruction, if we continue to elect Muslims into our Government. They routinely LIE, when it suits their purpose. They believe in Sharia Law, which is basically the OPPOSITE of our Constitution. They hate Jews, Israel, and Christians ! WHY would we put people like this in a position of POWER ? They actually insult any with an ounce of intelligence. Just by listening to one of these idiots like Tlaib or occasional Kotex you lose at least 50 IQ points. The Cultural Marxists have now signed a ‘death pact’ with the Cultural Jihadists, and Judeo-Christian culture is the bullseye. Naturally, our ever-vigilant press corps uncovered this highly relevant (and charged) information and made the public aware of it well in advance of the election, so that our Representative Republic can have the informed electorate that it needs to steer it wisely. Just like they dug their teeth into 0bama’s past and wouldn’t let go until all questions had been answered. If anything, IF THIS WAS discovered, you can bet the complicit media hacks, would have done all they could to cover it UP! She needs to resign. The illegal immigrants are breaking the law just by being here, and should be deported for that reason alone. Beyond that if they further break the law, they should be deported more quickly, and with even less consideration of the family. If they have minor children, the children should accompany them to their home country (and that is not the US). No. NOT resign, but fired, arrested and sent to JAIL FOR HER RABID Support of illegal invaders, over US Citizens. OR if it qualifies as treason (which to ME it bloody well should be), she should be hung in the public square. How Americans could elect this puke Tlaib is beyond me! A little more clear now? This women needs a room at Gitmo! Read on another site; One of the men who worked for hillary washed-up on the banks of the Patomic River in Maryland. The illegal alien border crashers aren’t citizens and are not protected by the Constitution. They were just tired of eating bugs and grass. Deport! It is quite understandable that Ms Tlaib would speak in favor of people who live in a country other than their correct nationality because, as a Palestinian, her people do not belong in Israel but in some location outside of the Middle East. This is because, thousands of years ago, God gave that entire area to the Hebrew Jews forever. Thus she advocates for another group of invaders into a country; the illegal alien Hispanics from Central and South America. America should deport illegal aliens. What about my rights as a US citizen Ms Rashida Tlaib? My right to law and order, prosecution and removal of illegal entrants into my country. Your duty, need I remind you Ms Rashida Tlaib, is first to citizens of this great country, not foreign invaders that have broken our laws as their first act in our country. We support legal entrance but despise those that thumb their nose at our laws and culture. Will you Ms Rashida Tlaib earn our support of be despised? According to libtards like her. YOUR rights don’t matter.